Ms. Flynn, you got me. 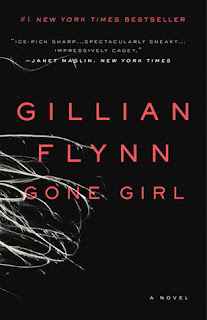 About Gone Girl by Gillian Flynn*: On a warm summer morning in North Carthage, Missouri, it is Nick and Amy Dunne’s fifth wedding anniversary. Presents are being wrapped and reservations are being made when Nick’s clever and beautiful wife disappears. Husband-of-the-Year Nick isn’t doing himself any favors with cringe-worthy daydreams about the slope and shape of his wife’s head, but passages from Amy's diary reveal the alpha-girl perfectionist could have put anyone dangerously on edge. Under mounting pressure from the police and the media—as well as Amy’s fiercely doting parents—the town golden boy parades an endless series of lies, deceits, and inappropriate behavior. Nick is oddly evasive, and he’s definitely bitter—but is he really a killer? I'm obsessed with this book. I can't get into the detail of this book without spoiling it for first time readers (or movie watchers) so I will simply leave the storyline alone: a quick review that is spoiler-free but may be somewhat cryptic in places. 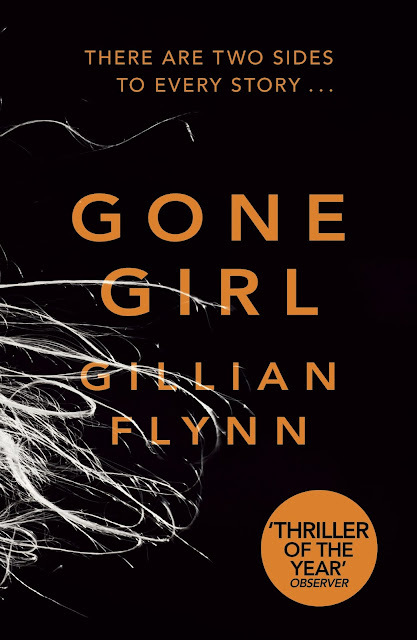 This entire book is a brilliant mind game played between a hubby and wife, and unwittingly a mind game that Gillian Flynn plays on her readers. There are two parts to this book and I've realized that readers either will play along with Ms. Flynn or simply hate it. It's a polarizing experience -- love it or hate it -- with a passion. I was dazed when I finished it. I went "Oh sh**" then heaved a sigh reeking of "OMG" and surprisingly, wallowed in the reality that is the twistedness and perversion that I had just read. Know the whole he said, she said shebang? This is the ultimate. This is all about a marriage and highlights the very intimate mind meld relationship that can exist between a couple. It can pendulum from the good to the bad, and this particular book shows the extremes that are often difficult to stomach. Another interesting dichotomy explored is the wide difference between reality (private persona) versus public perception. The role of media -- the good, the bad, and the ugly -- are fully expounded upon in the storyline. How many times have you passed judgment on a case or a person based on what you heard in the news, saw on TV, or even social media? We all do it. In this day of easy access to information, forming opinion based on the constant stream of fact (and plenty of fiction) is an easy trap to fall into. Lastly, I can't believe that I fell for Flynn's "game" so easily. The way that this story is structured out makes me want to read more of her work, for the simple (and awesome) reason that she has so much insight into her very readers' psychology. Not all authors can pull off a mind game so brilliantly, so annoyingly, and so effectively. Kudos, Gillian Flynn. In the back of my mind, what really struck me about Gone Girl is that it's very possible that this could happen, and to anyone. It's a difficult thing to accept that no one can really know any one person, no matter how close we can be, whatever relationship can bear some uncertainty. But it's doubly difficult to know someone's deepest, truest, and ugliest self ... and if not being able to accept it, to at least be able to acknowledge and understand. Looking for a mind trip? Try Gone Girl. Then tell me if you're in the love or hate camp! Highly recommended reading for those who despise predictable, cookie cutter characters and willingly desire to be surprised, shocked and challenged.